Post your decks and tips for Nissa below! My quick battle deck that has major success. Ramp, fatties and life gain. Suggestions for this Nissa Deck? 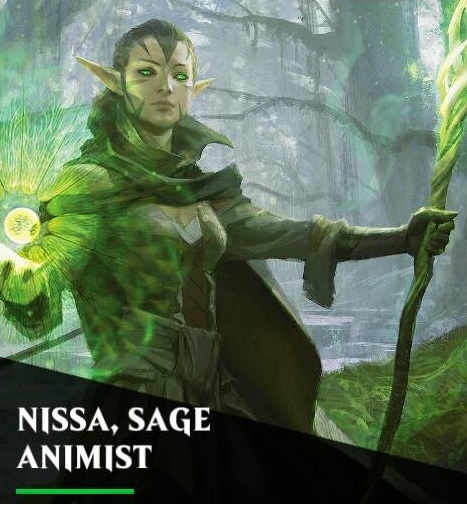 I have 0 Green Mythics, but Nissa is the first Planeswalker I've gotten to 60. Gladehart is expensive, I've used Outland Colossus in it's place before. I've considered Mina and Denn, but that isn't as consistent a source of Berserker as I'd like. I'm still working out the kinks but i've had great success with this. I call it the Punching Clown because once the primary mechanic is in place, the computer $h*ts itself and can't figure out how to get around it. The primary win mechanic isn't fast but its consistent. I queue up a Greenwarden before I get a Birthing Hulk or Sifter out and then drop them all at once. The sifter or hulk is constantly being brought back and bringing scions with it (mana gen!). i use the renewal to heal up in case i take too much damage on the way to getting it setup and if i set it off with Natures regrowth, i can usually get everything in my hand out. I'm struggling with creature removal. Any suggestions? A lot of the decks I see for Green have "animist's awakening" in them. However, for the life of me, I have been completely unable to get that card in any packs I open. Is there a replacement card that anyone would recommend for those who don't have it? In my view, that card isn't really a requirement - especially after it got debuffed awhile ago from 8 gems converted to only 5 (but the cost was reduced to 5 mana to compensate). It's a nice card to have once you have a lot of the other gem converting supports in the deck - otherwise it's not that useful most of the time as you'll likely "whiff" with the 5 bonus gems converted and result in the activated gem being countered easily more than half of the time. Also, what's your deck like currently? That could help us out with potential options. The idea is to make sure Seasons Past always has a Seasons Past to return to hand. I've never managed to get the loop going, but I have managed to cast a full hand and get a pretty impressive UC and/or Hydra out. It might be worth replacing Fortified Village with something like Magnifying Glass to have more card draw: I've cast through my whole hand more than a few times with Seasons Past. If you have Bring to Light or Pyromancer's Goggles give them a go with it. Mirrorpool also sometimes gets the loop going. My Nissa is currently only level 31 so there are limited choices on how to use her. I decided to take the route of a landfall deck since I have the cards for it, or at least some cards for it. I am always looking for advice though and appreciate all of it. Below is what I have with an explanation. This deck is limited by her level currently but should be decent. If you have any suggestions I would love to hear them. My card pool for this deck is limited at the moment but I am always wanting to hear ideas. - The big absent is Animist Awakening (R). - I'd love to include Emrakul, the Promised End (M) too, should be better than Lurker (but Lurker is really good). 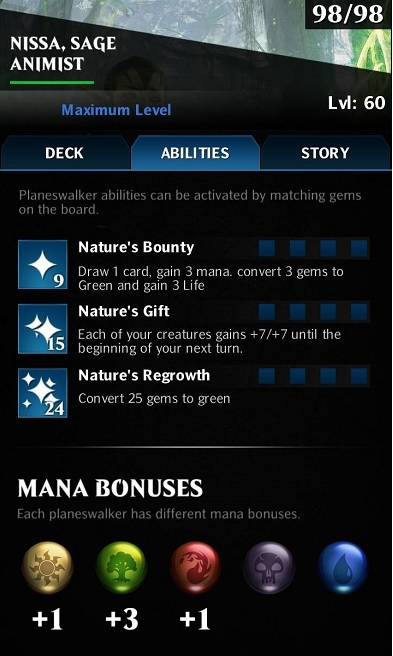 - We only play the first ability of Nissa that does everything we need : mana generation, creation of green gems and card draw. Gaining life is accessory. - naturalists and leap can be replaced by cheap (were)wolves and Emrakul event (were)wolves bonus is yours. - Since it can target itself, Lurker is good at getting the Eldrazi bonus too. Shadow-Mage, why are you using Corrupted Grafstone over Nissa's Pilgrimage? Corrupted Grafstone makes sense for other color planeswalkers or if you want to have both. But for green it's just a more expensive Nissa's Pilgrimage (7 mana vs 3). Both have three shields. You should play both actually. This is new, and mostly a copy of a list I saw on the boards here, but it seems to work pretty well. I am thinking about swapping Undercity Troll into replace Rhox Maulers. I don't tend to see much discussion about decks on the boards here. Is there some secret club we don't know about? Anyway, I was looking for some feedback on my Nissa deck to see if there's anything obvious I'm missing to improve it. Once I got my first Mythic (Grafwidow) I wanted to design a deck around it. Unfortunately I don't have a big collection as I'm still pretty new. I was consciously avoiding Nissa's Pilgrimage and the like to try and trigger the delirium on the Grafwidow. I have been having mostly success with the deck, though I am only in silver. Would love to hear ideas and feedback. Mostly I'm thinking around dropping Lanowar Empath, though he is a good target for Reclaim. With Kaladesh, came an awesome rare for Nissa - Cultivator of Blades. This card is awesome. Just get any 3 creatures out (including the CoB), combine with Nissa's 2nd ability can result in 60pt + damage swings. Sylvan Messenger can help you find the CoB, Oath of Nissa for more mana, plus to help you find that right card when you need it. The Servant of the Conduit is there because I don't have any better elves. I was running Drownyard Temple instead of Equestrian Skill, but I find this rolls a bit better. I have tried this composition that is giving me a 90% win approx. This alternative is funny and destroys decks with no big critters. Had to use the search bar to find this thread! I've been tinkering non-stop with origin PW to make them a bit more appealing given the roster of strong PW that have been coming out consistently. Her first is to be spammed and 3rd to activate adapted gems if a Kraj just got on the board. With this deck I have found little problems so far. Even managed to hold of an AI Brokhan with a dinosaur deck while losing only 12hp. It cascades very good. And at times too good that makes me question Incubation Druid and it's gem conversion. So an excellent alternative is Growth-Chamber Guardian(UC). The adapted gems of it will most likely trigger with the cascades and give a creature copy to be fed the excess of mana from cascades that get too big. This green deck was made with only Nissa, Sage Animist in mind. Should also work as a mirror for Vivien.